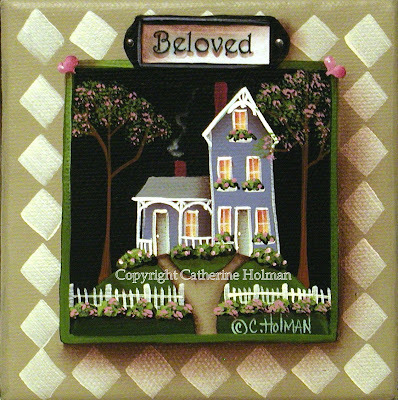 Catherine Holman Folk Art: Sugar Plum Bakery Folk Art Painting and a Giveaway Painting! Sugar Plum Bakery Folk Art Painting and a Giveaway Painting! "Sugar Plum Bakery" is the newest addition to my Ebay auctions. Auralee's grandmother taught her to bake when she was a young girl and she turned this talent into a business. Very early in the morning the sweet scent of bakery confections and coffee concoctions drifts through the air guiding loyal customers to the Sugar Plum Bakery. Customers feel that the climb up the hill each morning and the descent down help to alleviate the added calories that her tasty treats cause. 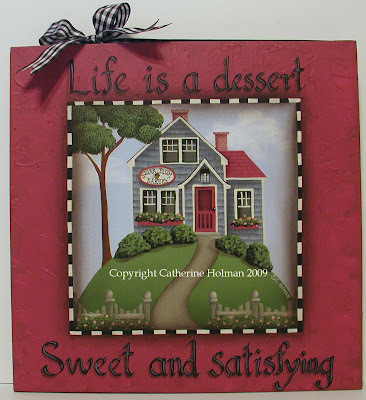 Her motto is proudly displayed in her shop, "Life is a dessert, sweet and satisfying". A black and white checked border surrounds the scene. 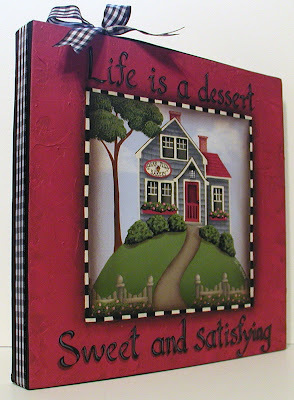 Auralee's motto is lettered in black on a clay, red textured border. A coordinating black and white ribbon is wrapped around the edges of the canvas and is tied in a bow at the top. Click on the photos for a closer view. Remember life is a dessert so savor it! 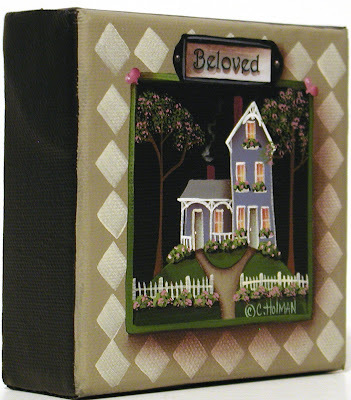 Win this little 4" x 4" canvas "Beloved" painting. Each and every one of my blog readers are very dear to me, so I decided on this painting for this particular reason. Just leave a comment on this post for a chance to win. For another chance to win, please mention my "Giveaway" along with the above photo on your blog, then come back here and leave me another comment to let me know. Be sure to leave an email address on your comment if you don't have a blog link so I can contact you if you win. Bob and Mona have known each other since they were little children. They were neighbors and walked to school together. They started dating in high school and were married not long after they graduated. The two newly weds purchased a little cottage and made it their own where they raised two children and a variety of pets. They know that their "Beloved Lord" has blessed their lives and hope they can be worthy of his grace. That is a beautiful little painting!!! And "beloved" is one of my favorite words! I am going to post this on my blog now!!! OK! I have posted it on my blog!!! Love both paintings. Please enter me in your giveway! What a lovely giveaway! Anyone will be so lucky to win this! I would LOVE to be considered to be caretaker of this or any of your lovely paintings and so honored to do so! I will gladly pass on the word on my blog! Have a delightful weekend! What a precious little painting. This is a very generous giveaway and thank you for giving us the chance to win a piece of your art. I will post your button and be back to tell you. What a beautiful new painting you put on ebay!! I love it! You can count me in for a chance to win the little beloved painting! I am posting it on my blog too! Thanks! Catherine I forgot to leave my e-mail address: cmcdermitt1@carolina.rr.com. I also posted your giveaway on the sidebar of my blog! Thanks again!! WHta a beautiful piece-please enter me into our drawing-thank you! Both paintings are fabulous, Catherine! Oh how I would love to win! What a special painting! I have the perfect spot for it! Count me in! I love both of the paintings in your post but then I am a fan. I enjoy looking at your prints I purchased several times a day. Since they sit on my piano, I pass by them all of the time. Sign me up for a chance to win another CH creation. A wonderful painting, as usual! Both beautiful paintings with great stories, Cathie. I'll announce the giveaway on my sidebar! How pretty! Looks like a perfect little Lavender cottage! And you KNOW I love your art! Thanks for the giveaway and for coming to my cottage to see your art displayed in my home! Thank you! Thank you for another chance to win something from you Cathie! What an beautiful painting. I sure hope I win!!! I'm going to put a post on my blog RIGHT now!!! It is beautiful!! please throw my name in the hat thanks. Great paintings! As always a wonderful little story to go with it! Please count me in for a chance to win!! Thanks for the giveaway!! Hi Catherine. This little painting is so representative of the style that made me fall in love with your work and your books. I would love to be entered in your giveaway! Very nice of you to offer such a wonderful giveaway! Good luck to everyone. Now I am off to post on my blog! Oh, that is just the most precious painting. We have just moved to the country, and it would be just perfect here. I am new at this, and will try to add to my blog. Okay-I hope I did this right. I added your giveaway to my blog. Ohh Catherine they are both so beautiful! Please enter me into your fabulous draw, I need to win!! I love your style! Very nice. I'm going to go over to my blog now and post a link to yours.. I'm back to tell you that I mentioned your giveaway at my blog. Thanks for giving us this opportunity. I just came over from BJ's where I saw your comment. I love your art. I would love to win this, please enter me in your drawing. I'm off to post this on my blog right now! How pretty! What a lovely giveaway gift. Just adorable!! Put my name in the paintbox for sure. Okay, you are being promoted on my sidebar!! That is a great giveaway prize. I could not get your beautiful art pic to load, but did post about your giveaway. Oh boy! How did I miss this for so long? Oh well, I'm just happy that I get to use your art to decorate my sidebar...sweet indeed! This is beautiful painting I would love to win it I have posted it on my blog!! I´m crazy with your painting!!Lovelyyyyyy!!! !Ilove your houses!!!! Ok Catherine I fixed that small but very important detail, and I think I made it sound quite enticing to come take a look! This is a beautiful! What a lovely giveaway! I came over from Kathy's Cottage. Your paintings are wonderful! I would love to own one!! What a beautiful work of art. I'm visiting by way of Kathy's Cottage and I'm so glad I did. I love your work...and I would love to win this. Please do enter my name and wish me luck! I posted the giveaway on my blog! I want that darling print!! LOL! Wow...LOVE your work! Please enter me in your giveaway. I'm off to read the rest of your blog!! I love it all! You are so talented. I love to play with flour/bake so I have the perfect spot for this in my home! What wonderful paintings!!! Love these! What an amazing giveaway too!! We hope we might be the lucky winners!! fingers crossed! Catherine, what a beautiful painting! I would love to win this painting for my parents, as your story reminds me so much of them. They grew up as neighbors and starting "going together" when they were in Jr. High. They married shortly after high school, raised three children and many pets, and have been married for almost 55 years, serving the Lord. I know whoever wins this precious painting will be blessed indeed! Both are so beautiful! Your stories make me smile and think how lovely life can be! Please enter me! Thank you for having this giveaway!! the little story is very sweet, like made in heaven, as the chinese saying goes. love the little painting, just perfect with the story. god bless. I seriously have goose bumps! and it was a very beloved home for us! We left our hearts there when we moved. I would be thrilled to win this painting Catherine. I have adored your work and this would be a wonderful memory for our family! This is just beautiful. I would love to be included in your give away. Thank you so much. oh I love it. I found you through Darla's blog. This painting is so pretty. Does it help to beg??? What a sweet little painting. I found you through Valerie at Life's Little Garden. Thanks for allowing me to be a part in the giveaway. I came over from Mimi's cottage. What a creative talent you have. I love your paintings, and would love to be entered into your giveaway. Thanks for sharing your talents with us! I would love to have this grace our Beloved home. Oh I'd love an original painting! I adore the prints I have and this would be so awesome. Thanks for the giveaway. I'm off to blog about it now. :) Blessings! I've added a post to my blog! Here's hoping! Your canvas is only 4" square? How enchanting! This is beautiful and I have the perfect place for it. Have a blessed day. I just found your wonderful Blog! I love your artwork..it is so inspiring. Put me down for the giveaway! I would be honored to win this lovely little piece of your artwork. Oh this is too sweet! I would love to be entered in this lovely giveaway! So glad I found your blog!! How kind of you to have this give away. I would love to enter. What a generous and absolutely beautiful giveaway! Your work is so inspiring, and it would be wonderful for any of us to bring "Beloved" home...please add me to the list for a chance to win! LOVE your artwork...it really touches me! I just happened to find your blog this morning and I really did enjoy it. I love the painting and would like to be considered. I did post your giveaway on my blog along with your button. I think I forgot to come back and tell you. I am keeping toes and fingers crossed for this cutie!! Please count me in. What a lovely giveaway. Ooops! Forgot to add my link to my entry. oops, forgot to leave my email. What a beautiful painting! I am so glad I found your blog before the giveaway closed. Okay,I put your link on my blog! Hopefully all of my readers will come to yours! Well, I've tried to leave a comment and then one for my blog that linked to yours, but they don't seem to be coming up, so I'll try again. Do I get 2 chances for the painting, or do I need to come back? The painting is lovely! Beautiful painting with a wonderful story. I would love to be entered in your giveaway. What a beautiful painting!! I would be honored to hang it in my home. Oh that is a beautiful painting and would be honored to hang it in my home. Thanks for the opportunity. Please enter me in the give a way!! Have a nice Spring Day Catherine! Beautiful painting.. would so love to hang this where I could see it every day... please enter me.. Catherine...I thought I signed up already but now I see I didn't...must be a little nutty!! Yes, please do enter me into your beautiful giveaway. Thanks so much. How stunning. I so admire this painting talent and ability...I have NONE in this area and so admire it in others. i love your painting please enter me. thank you. You do the sweetest paintings! Anyone would want to live in one of your houses. Have you picked a winner yet? Did I miss it?